The various components of an air-conditioning unit, such as coils, filters and fins, are all subject to natural wear and tear and accumulation of dirt and debris. Without regular maintenance, the performance of an air-conditioning unit will steadily decline while its energy consumption will steadily increase, until the unit ceases to work altogether. In a typical central air-conditioning system, the evaporator coil, located indoors, absorbs heat from the indoor air and releases that heat at the condenser coil, located outdoors. Even if filters are cleaned or replaced regularly, dirt can still accumulate on the evaporator coil, insulating it and reducing its ability to absorb heat. Check the evaporator coil once a year and clean it if necessary. The condenser coil is even more susceptible to contamination from falling leaves, foliage and grass trimmings, so you should designate an area — at least two feet by two feet — to allow adequate airflow and keep it free from dirt and debris. Obviously, how often you need to clean the condenser coil depends on the potential sources of contamination outside your home, but once or twice a year is usually adequate. The easiest way to do it is to turn off the thermostat, spray the condenser unit with a garden hose, let it dry and then turn on the thermostat again. During the winter months, if you cover you’re air-conditioning unit to protect it from the elements when not in use, then leave the bottom 12 inches of the condenser coil uncovered to allow it to ‘breathe’. On a related note, if you disconnect the power during the winter, which can produce small savings in energy costs, remember to energise the unit for at least 24 hours before using it again. Air-conditioning filters may be located in ceilings, furnaces, walls or in air-conditioning units, but they are the most important components as far as regular maintenance is concerned. A blocked filter obstructs the normal flow of air and may allow dirty, impure air to enter the evaporator coil, impairing its ability to absorb heat and increasing the energy consumption of the system by up to 15 percent. 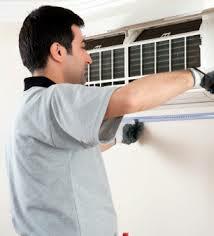 Some types of filter cannot be cleaned and must be replaced. In either case, you can see if a filter is dirty and needs cleaning or replacement simply by holding it up to the light. Once a month is usually often enough to check filters, depending on the climate where you live and the presence of airborne contaminants, such as dust or pet hair, in your indoor environment. Air-conditioning systems employ fins on the evaporator coil and the condenser coil to allow air to flow smoothly through the system. However, these fins are fragile and can easily be bent out of shape, restricting air flow and reducing the efficiency of the unit. You can buy a repair tool, or ‘comb’, specially designed to straighten evaporator and condenser fins, as well as cleaning away any accumulated dirt and debris.